An elegant looking towel hook that also works better than the traditional version you are using now. Made entirely of sturdy stainless steel, this patented towel holder will make hanging stuff quicker and easier. It will also offer a more gentle grip, so while it is able to reduce the occurrence of towels falling on the ground, it will also be less harsh on the actual fabric being held. This means that your expensive towels and other items will last longer, and will never be stretched out, or ripped as a result of being hung when not in use. Stick one of these useful little guys almost anywhere because they will easily mount to any clean, smooth surface. Just reveal the industrial strength adhesive by removing the backing, and then install on a tile in the bathroom, a cabinet in your kitchen, or even the wall of an RV or workshop. Once mounted in place, you will have a great looking way to hang items when you are not using them, and also a more secure way. Use it for bath towels, hand towels, garbage bags, pot holders and more. The possibilities are vast for this remarkable set of stainless steel hooks. 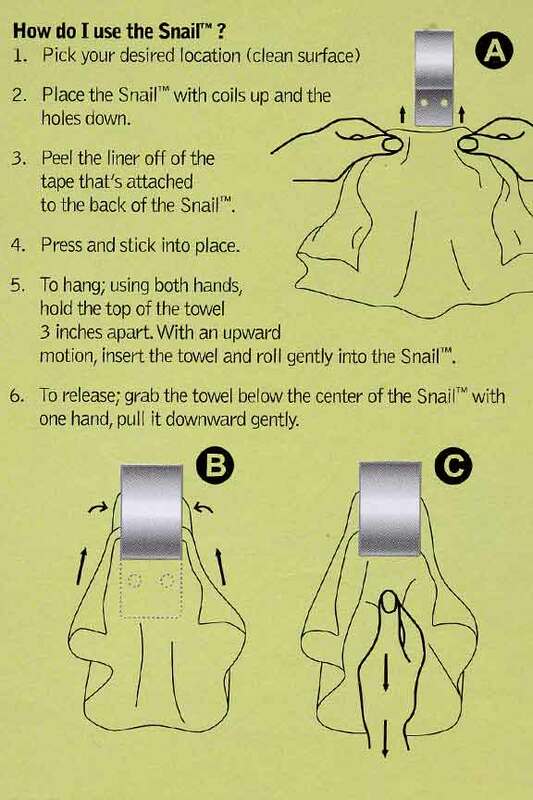 Using The Snail Towel Holder is easy. You do have to hang things differently than with a regular style hook, but once you do it a few times, it will become second nature. When hanging a towel, use both hands, and position them about three inches apart at the top part of the towel. After that, simply slip the towel into the holder with an upward motion. Continue inserting up and around to create a secure hold. This gentle rolling action will create a tight grip, but without any pressure points or strain on the fabric.Any item hung will remain in The Snail until you decide to remove it. To take something out, just grip it below the hook, and pull straight down with one hand. It will slip right out, quickly and easily. When pulled straight toward you, or in other directions besides down, it remains secure thanks to the patented design. It is so sturdy, that it can hold up to ten pounds per hook without failing. With The Snail, installation is even easier than using the actual hook. They will quickly mount to any clean, smooth surface without the need for screws, nails or other hardware. You can certainly use screws if you want to make it even more secure, or to ensure maximum longevity, but it is not necessary for most surfaces. On drywall, wallpaper or textured areas, you will need to use screws in order for the hook to stay secure for a long period of time, but the integrated holes make this process easy. When installing on wood, tile, plastic, metal and other surfaces, the included adhesive backing will be more than sufficient to keep the hooks in place. To install, simply remove the backing, and press firmly to your freshly cleaned area, and the installation process is done. 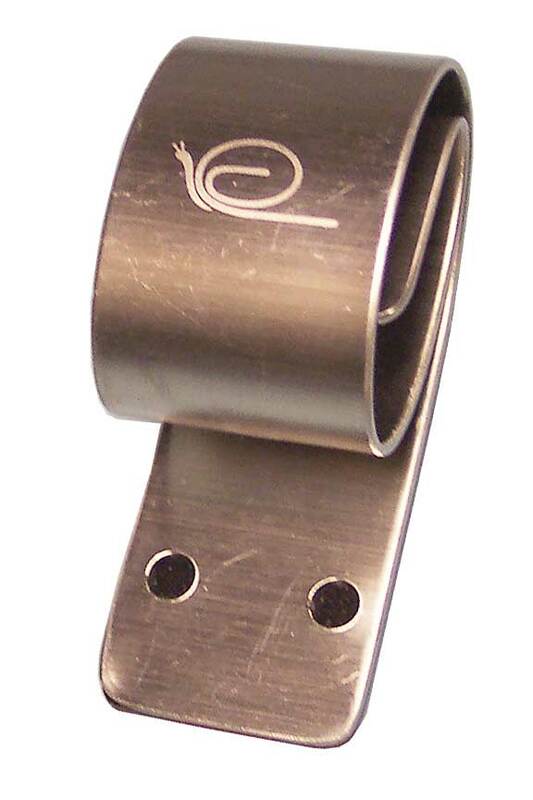 The hook will remain securely mounted for many years without the use of hardware. For surfaces that require the use of hardware, or for anyone that prefers to use it, secure the hook with the adhesive first, and then drive in your screws to complete the installation. For the perfect installation, you will want to use a level to ensure proper alignment, but in most cases, "eye-balling" it will be sufficient. These hooks are ideal for use in the bathroom as a holder for bath towels and hand towels, or in the kitchen for pot holders, kitchen towels or bags. You could also use them in an RV, out in your garage or shed, or even in the laundry room or basement. Anywhere that items are hung regularly could benefit from a set of these hooks. Thanks to the sturdy materials and patented design, hanging things will be effortless, and they will stay in place, and remain secure until needed again. Unlike traditional towel hooks, it is very hard for a towel to slip out of The Snail by itself, yet quite simple when you pull in the right way. This will help to prevent slippage and falling, in order to promote drying, and keep fabrics clean and unharmed. Stop using ugly towel holders that only offer mediocre performance. Upgrade the look of your kitchen or bathroom while providing a better way to hang towels and other items. Stick some on the back of the bathroom door to hang bath towels after the shower, or put one on your bedroom wall to hang a nightgown or robe when not in use. They work great in the kitchen too, so place one on the inside of a cabinet to store hand towels out of site, or install one on the wall behind your stove to conveniently place pot holders and other items right at your fingertips. This versatile product can even be used outside the home in a boat or RV, and makes the perfect rag holder in the garage as well. These great looking hooks work better than traditional versions and can easily mount anywhere you need them. Order Yours Today! Uses Hanging towles, bags, pot holders, etc. Perfect for bathroom, kitchen and more. Compatibility works almost anywhere - install on any smooth, clean surface. Screw installation required for textured surfaces and/or drywall and wallpaper. Hardware Included No - Screws are optional. Industrial adhesive included for installation purposes. 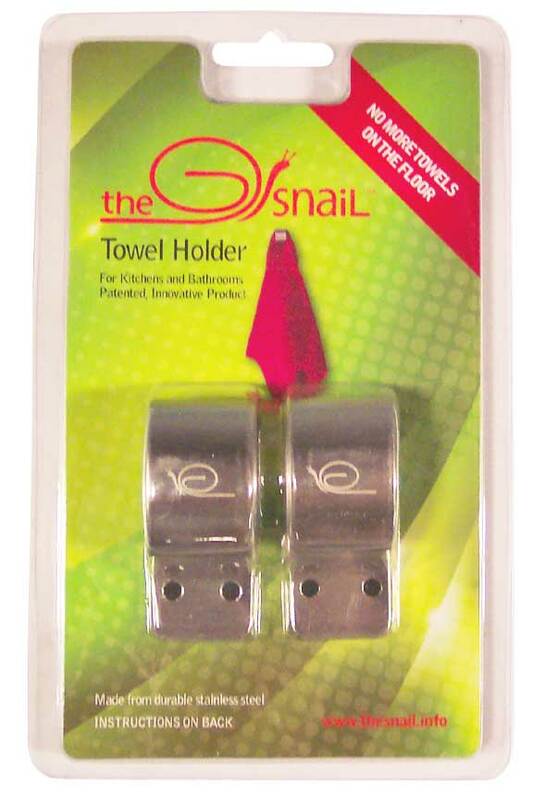 The Snail Towel Holder - A two pack of stainless steel towel hooks. They look great and work even better. Use almost anywhere to make hanging quick and easy, but also to prevent hung items from falling. Order Yours Today! The towel holder works great. Solved a 20 year old problem of where to hang the damp towels after wiping dishes. Bumps don't bring down the towels. 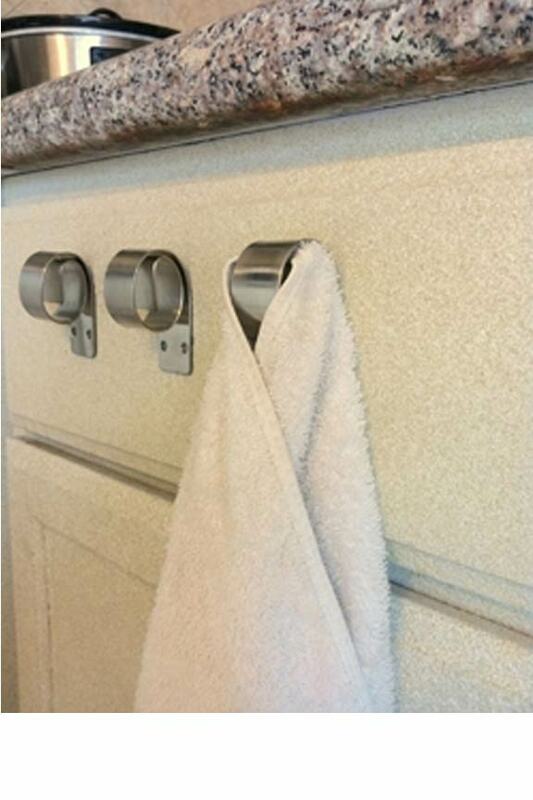 We put the Snail Towel Holders in the bathroom of our small 5th wheel camper to hold our bath towels. We drove 3,000 miles on a trip to Washington State staying off most freeways and going over some pretty bumpy back roads. The holders did a wonderful job of holding the towels up. The towels did fall off about two times but that could be due to not fastening them correctly. The holders stayed attached to the wall through a multitude of temperature extremes. We have two more we'll use in the camper for coats. They look nice as well! They look and feel like they will last forever . The snail will hold Any rag or towel even when wet . The snail can't damage wall or rag if pulled off fast when mounted correctly . Buy it and Try it . I promise you will like . I looked for over three years for a smart, strong metal not cheap looking plastic or wood that breaks or starts getting wobbly pegs . Or some long bar that takes up alot of room on the wall . The snail is the product to get . Best towel hanger ever for a limited space! Holds securely-even heavy thread count bath sheets. Also great for kitchen cabinets in front of sink for cup towels. Highly recommend!